Common Practice Harmony on the Guitar. 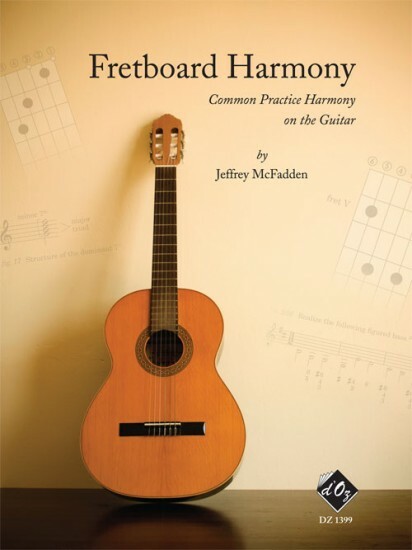 Fretboard Harmony is now in use in many renowned institutions worldwide, including Eastman School of Music and Yale University. Materials are presented in a logical order which follows the consensus evident in materials from the neighboring disciplines of music theory and keyboard harmony. It is a truly practical method with a vast number of exercises - 265 in all. Several exercises are given for each new theoretical concept introduced. There is a step by step, progressive arrangement of exercises. Emphasis is placed on creativity, experimentation and improvisation in the playing of the exercises. The book has a very complete section on rudiments. There is a clear layout and effective directions for the student. Scale cells, one-octave moveable scale forms, are used to give a basis for interval study which in turn is used to inform the formation of chords. Numerous chord charts are given to illuminate fretboard shapes and give a clearer picture of chord derivation and logic. The books offers a complete system of chord derivation using "cardinal" and "dilated" triads combined with doubling and/or omission. There is a section on the derivation of common, familiar chords and cadence formulas using the system. Figured bass realization and melody harmonization are used consistently as tools to introduce new chords, new progressions, etc. Numerous realized solutions are given and explained in detail for exercises in advanced application. Examples from the actual guitar repertoire, are richly deployed throughout the text to introduce chords, demonstrate progressions, show modulation, etc. There are numerous melody harmonizations and figured basses created from the common guitar repertoire. "For years I taught a course in Fingerboard Skills (fingerboard harmony) at Cal State Fullerton. I searched assiduously for a text that would be usable, given my concept of the course structure. I imagined that I would write such a text - someday - but I never got around to doing it. I always had to cobble together a hodgepodge of items from a wide range of sources. Well, here is the book I would have wanted to use. Very many guitarists (maybe most?) suffer from inadequate knowledge of the fingerboard and from insufficient familiarity with the logical patterns that musical elements form on the guitar. Increased command of basic harmonic concepts on the instrument brings greatly improved sight reading, memorization, and musical understanding. These, in turn, contribute significantly to secure performance and more informed interpretation. The book proceeds systematically from elementary scale forms to interval shapes and common chord patterns. Building upon these, it presents chord progressions and simple modulations within common-practice harmonic language. Along the way, the student is introduced to figured bass and harmonization of melodies. Numerous exercises give plenty of application and encourage further experimentation and improvisation. This book has been a long time coming. How many times have we heard that guitarists don't know enough about the fretboard, and the harmonic practices within it? Whereas it is almost common to expect a pianist or a cellist to know everything about how music works within the context of their instruments, the guitarists of the world are often assumed to be lacking the basic knowledge: This book attempts to address that problem. There are many features of the text; for example the materials presented are in a logical order that mirrors materials from music, theory and keyboard harmony. There are many actual practical exercises, and every time a new concept is introduced it is backed up by several exercises, which are progressively arranged. Unusually there is great emphasis placed on improvisation and the ability to experiment, thus enhancing the player's creativity. Much is made of interval study by means of scale cells and moveable one-octave scale forms that lead to the formation of chords, and indeed the book offers a complete system of chord derivations, and many more things besides. With 14 pages devoted to intervals, 40 to chords, 6 to figured bass notation, 20 pages to chord progressions, and 6 to harmonisation of melodies to name but a few examples you can see that it is very detailed and extremely thorough. The book offers the guitarist a true insight into how harmony works on the guitar, and if any other book does the same, then I have most certainly never seen its like. Indispensable. This is a book for serious students of the guitar. You should be familiar with the fretboard in standard tuning and have the ability to read standard notation, along with familiarity with diatonic harmony (i.e. the kinds of things that students of most instruments are expected to know about their instrument - for some reason, the guitar seems often exempt from that). The book is of very high quality, with heavy paper and the pages are not overly crowded, making it easy to read and work with. There are plenty of exercises to insure that you are understanding what is being taught.